Blue Chameleon is lonely and wants to find a friend. He can turn himself into all sorts of shapes and colours so everytime he meets something or someone, might it be a sock, and snail, boot, fish or banana, he is able to change so he looks just like them. Despite this, nobody wants to be his friend and soon Blue Chameleon feels like giving up … that is, until the appearance of a colourful new playmate. As minimalist as can be, this picture book is another stunner from Emily Gravett. The symetry in each double spread, the stroke of the pencil still visible makes this book an absolute feast for the eyes. Gravett, as usual, plays with little details, and it is a pleasure to pour over those illustrations. 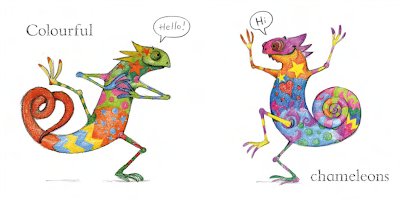 The double spread of the chameleon blending into the white page is simply stricking, and my children were just awed by the effect it creates. This is a great book to introduce colours and shapes to younger children. But it also works on a higher level, raising issues about being different and fitting in. My children are 5 and 7 and despite the sparse text, they were utterly engrossed in the book. 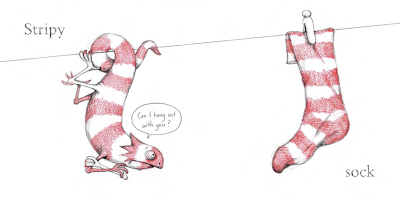 This is another triumphant title from Emily Gravett, who in my eyes, simply cannot do anything wrong. Macmillan are in the process of launching an Emily Gravett fan club. The details will be available on her official website. Thanks to Kate at Macmillan for sending me a copy of this book.